Patients with MS will soon have access to a new test which can tell them exactly what type of MS they have and how well their medications are working. 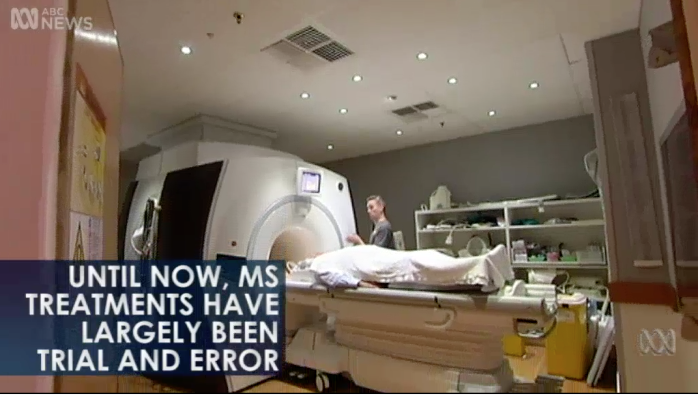 At the moment, patients have to have an array of expensive tests to determine what kind of MS they have. The study, published in Nature scientific reports, shows a blood test could greatly simplify and speed up this process, allowing doctors to adapt a patient's treatment more accurately and rapidly. Neuroscience Professor Gilles Guillemin from Macquarie University said the discovery was the culmination of 12 years' hard work in the lab. "We can tell you which sub-type of MS you have and if you respond to treatment," he said. At the moment, patients have to wait weeks on a medication to see if it is effective. "If you can have the blood test and see the marker not working, and this treatment doesn't work, the clinician will be able to realise very quickly change to another therapy," Professor Guillemin said. MS is a debilitating disorder of the central nervous system that affects more than 23,000 Australians and 2.3 million people worldwide. Mike Hemingway was diagnosed with MS 15 years ago, but doctors could not tell him which form of the disease he had. He was pleased to hear about the new test. "It will make a substantial difference. For me, yes I would have liked to know 'this is what I have got'," he said. Doctors hope if patients are put on the right drug earlier they will not be affected by MS as much as patients like Mr Hemingway have been. "The earlier you can have those treatments the less damage there is going to be to your central nervous system and things like cognitive problems and walking problems vision problems hopefully will become over time things of the past," Mr Hemingway said. Matthew Miles, chief executive of MS Research Australia, said it was a "stunning breakthrough" for Australia and for Australian research. "It's absolutely critical that we understand which type of MS, so people can be treated with the right therapy quicker, particularly when other therapies for progressive disease become available," Dr Miles said. "There's the potential for being treated earlier, there's also the potential for being much more in control and peace of mind so you understand the disease." The lead researcher of the study, Edwin Lim, who is currently based at Macquarie University, said the breakthrough was an important move towards personalised medicine for MS patients. "The unique information that we will receive from the biomarker within an individual, means that it could also be possible develop biomarker guided personalised treatment for each patient," Dr Lim said. The findings could have implications for other conditions such as Alzheimer's, Parkinson's, and motor neuron disease. The test relies on detecting compounds in a pathway of the brain using a substance called tryptophan.